The challenge with building a new guitar model is that not all the jigs and fixtures that apply to the other guitars apply to the new one. 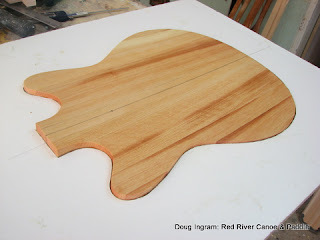 The new guitar that I am making utilizes a tilted soundboard to allow for the elevated fingerboard. So I have to make a whole new solera, and I have to figure out how to do it! 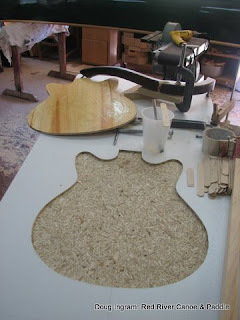 These are the challenges that make the guitar building so appealing. 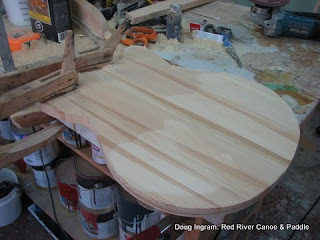 I need to set the dished portion into a panel so that the mold rests level with the top of the work surface. There are a number of reasons why, but it would be too much to try and explain here. I glued it in with epoxy. Posted by Doug Ingram at 9:55 p.m.